Travelport has announced that Swiss is the latest carrier to sign up to its innovative airline merchandising technology, Travelport Rich Content and Branding. As such, its fares and ancillaries are now ready to search, sell and book through Travelport Smartpoint. Following this new agreement, Swiss will be utilising Travelport’s advanced technologies including Rich Content and Branding which provides much more comprehensive product features than ATPCO branded fares. 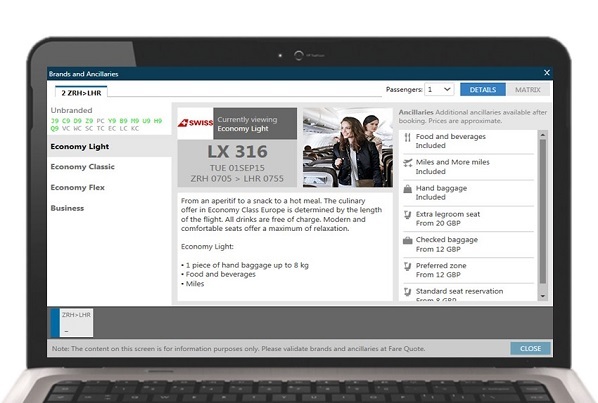 Through Travelport Smartpoint, agents have access to the ATPCO offering and much more, including detailed information on Swiss’ cabins, brand imagery and product descriptions. In addition, agencies will be able to compare ancillaries, including Swiss’ additional baggage purchase option, which allows for more effective upsell opportunities. The new agreement also means that agents can now access Swiss’ new fare structure for Europe including Economy Light, Economy Classic, Economy Flex and Swiss Business. Swiss International Air Lines is the national airline of Switzerland serving 106 destinations in 49 countries all over the world from Zurich and Geneva. With a fleet of 95 aircraft, Swiss transports around 16 million passengers every year. Marcus Frank, vice president at Swiss commented: “We are happy that in cooperation with Travelport, we can now provide travel agents and travellers with a richer understanding of Swiss’ content who can, in turn, more efficiently present our products to our joint customers.